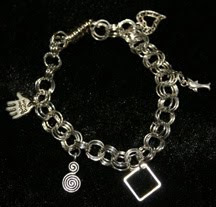 Thought I might share some photos of a couple of bracelets I have made in the past few days. These are all made from silver plated jump rings and anodized aluminium jump rings put together in different combinations. 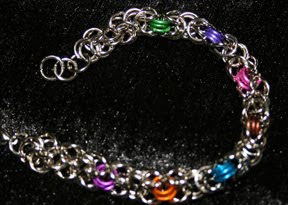 The two with the coloured rings are a Byzantine Chain Maille design and the other one is a 3x3 with charms. 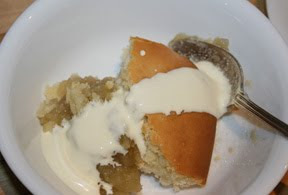 *** "Davine Time" Update - I am not a huge sweets person, I love savoury, but today I decided to treat myself with my favourite desert - "Apple Sponge". Mmmmm it was so so yummy. The bracelets look wonderful but not really me. The pud however looked just as wonderful and REALLY me!! Thanks for turning on my taste-buds!! Think you deserve it after making all those braclets. Gorgeous bracelets. I've never tried making any like that. Are they difficult? After your post on Viking knitting, my daughter and I went searching the old internet to find out more. Oh my goodness, the hankering to start something new when I have so much to finish that is old. I don't know whether I am in your debt or if I should scold you for leading me on. The VK is awesome and has a spell on me. Now today's post will stir a chord in my daughter. Before Christmas she gave herself an early present of chain mail jewelry instructional book and supplies. Maybe she will get busy after seeing your fabulous bracelets. A bite of apple sponge, close a jumpring. Bite of sponge, close a jumpring...lol...that would have been my method, resulting in weight gain and a very sticky bracelet!!! 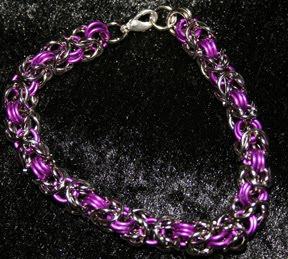 What gorgeous maille work you do! Lovely work Davine, my fav is also the top one even though I'm a pretty "simple" country girl when it comes to decorating myself. I wear a gold chain, diamond earrings, and a watch. That's it. Bec: That bracelet is $25.00 if you still want it just email me. Mark: Glad I could help the taste buds. Shirleyanne: Thanks, I find it pretty relaxing making them. Debbie: Give it a go. They are not difficult, some are a bit tricky to start of but just keep going. Darlene: Nothing like decorating ourselves.